Security breaches at nuclear power plants are never a laughing matter. But with oil prices at near-record levels and the rush on to find safe, clean sources of energy, news of leaks at two different French nuclear sites could not have come at a worse time. Concern over the incidents is rekindling questions about the safety of France's giant nuclear power grid and could complicate the country's quest to become the world's leading purveyor of nuclear technology. On Friday France's Nuclear Safety Agency (ASN) revealed that damage to an underground conduit at the Romans-sur-Isère plant in southwestern France had allowed radioactive waste to leak, though in quantities so small, it said, to have "not at all affected the environment." But it was not the first such incident. The ASN announced July 7 that uranium-tainted waste liquids from the Tricastin nuclear plant, in southern France 30 miles northwest of Avignon, had leaked into surrounding rivers and topsoil. Inhabitants of the Vaucluse department were ordered to refrain from drinking water, eating locally caught fish, and irrigating crops with potentially contaminated water. The water prohibition remains in effect for thousands of parched locals as inspections lumber on. "We're being treated like sub-citizens," protested Yves Beck, mayor of neighboring town Bollène to the AFP. Qualifying what he called slow and unsympathetic response of authorities to the situation "unacceptable," Beck warns legal action for hardship and losses suffered may be taken. "We've told residents of Bollène, 'Don't sign anything unless you've sought the help of a lawyer.'" Fighting words indeed  and over much more than simply safe drinking water. Nearly 80% of France's electricity is nuclear-generated, and French giant Areva has made a massive international business of constructing and managing nuclear facilities. France has made nuclear power a national priority since the early 1970s as French governments of all political stripes sought to lessen the nation's dependence on foreign oil. The French public embraced nukes as the rest of Europe and the world said "no thanks." The result is France today has the second-largest nuclear network behind the U.S., and is the world's largest net exporter of electricity  a business expected to net around $4.5 billion in profit this year. All that has helped Areva become a world leader in the nuclear field, providing one-stop shopping with construction, management, maintenance, waste and storage solutions. Under president Anne Lauvergeon, the firm has been an aggressive player everywhere from China to Britain and a formidable rival to American companies General Electric and Westinghouse even on American turf. However, news of nuclear incidents anywhere on the planet  particularly in Areva's own backyard  tends to squelch the appeal of nuclear power, record oil prices or not. What is troubling about both recent French accidents is that they involved nuclear waste, the disposal of which is perhaps the major curb to nuclear power's appeal. Areva cited human error in the Tricastin incident and said it had fired the responsible director after an internal investigation found "evident lack of coordination" between administrative and working units had allowed contaminated waste to seep through the plant's theoretically impenetrable safety lining. Areva also faulted local operators for significant delays in alerting authorities once the breach had been identified. The ASN's said the Romans-sur-Isère incident involved smaller quantities of radioactive matter and was caused by an entirely different problem than the Tricastin case. But the agency also noted the leak discovered Friday may have first occurred "several years back." Environmental groups have cited the breaches as more evidence of nuclear power's spotty safety record, and anti-nuke organization Greenpeace noted the government's "belated concern" reflected its unquestioning confidence in the technology's reliability. 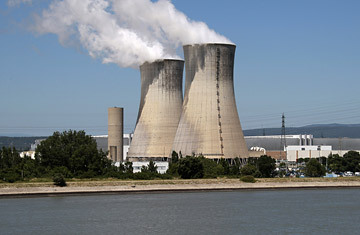 Though both cases have been assigned the lowest rating on the seven-point scale of nuclear accidents, officials are moving to protect France's nuclear reputation. Even before news of Friday's incident broke, French Ecology Minister Jean-Louis Borloo ordered inspections of all 58 French nuclear installations and checks on radiation levels in the underground aquifers surrounding them. Borloo stressed there was no grounds to anticipate additional breaches. "I don't want people feeling we're hiding anything from them," Borloo told the daily Le Parisien. Barring any further revelation of French breaches, this month's twin mishaps won't alter France's official policy on the technology  nor are they alone likely to undermine the French public's approval of it as a clean, cheap energy source. But should Borloo's inspections turn up additional failings, France's long-term bet on nuclear power could face shakier odds.